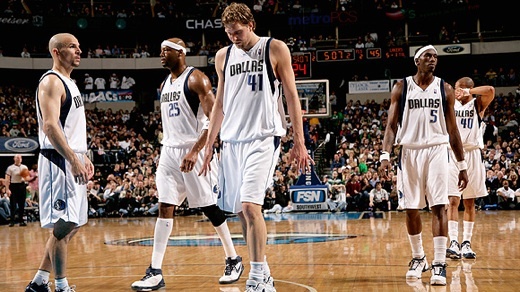 Before the Dallas Mavericks headed into the NBA playoffs last season, the team had extremely high expectations as they had just clinched the second overall seed in the Western Conference and was thought to be the only team in the West that was capable of taking down the defending NBA champion Los Angeles Lakers. Unfortunately, in classic Dallas Mavericks fashion, the team just fell apart in the first round of the playoffs and were beaten convincingly beat their division rivals in the San Antonio Spurs. Even though many people believed that the San Antonio Spurs were over the hill and unable to go far in the playoffs like they usually do, Tim Duncan and company just dominated Mark Cuban’s squad and proved that the Mavs didn’t deserve to be the second seed in the extremely competitive Western Conference. With yet another early exit in the playoffs after having high expectations of possibly being able to compete for an NBA title, the Dallas Mavericks will almost certainly be on the verge of shaking up their roster once again. Before the NBA trade deadline this past February, the Mavs made some drastic changes by acquiring Caron Butler, DeShawn Stevenson and Brendan Haywood. This was without a doubt a step in the right direction, but it didn’t help them in the playoffs and now the Mavs may have targeted LeBron James as the next face of the franchise in Dallas. Obviously, bringing in LeBron James is a stretch to say the least for the Dallas Mavericks, but if King James is ultimately going to leave the Cleveland Cavaliers, the best way to make an exit without leaving them high and dry is through a sign-and-trade deal. There will be no shortage of suitors for LeBron James this summer, but having the two-time NBA MVP playing in Dallas is intriguing, especially if Dirk Nowitzki does end up opting out of his contract. Even though the NBA season wasn’t even over yet, the Dallas Mavericks owner Mark Cuban already starting stirring the pot as he said he would love to have LeBron in Dallas and a sign-and-trade deal would be ideal for him as it wouldn’t leave the Cleveland Cavaliers high and dry. As a result of Cuban expressing his interest in LeBron James, he was fined by the league for free agent tampering, but getting fined is nothing new for the outspoken owner. The frontrunner to sign LeBron James during this NBA offseason is arguably the Chicago Bulls. Many people believed that the Cleveland Cavaliers were the favorite when they were knocked out of the NBA playoffs in the second round by the NBA Finals bound Boston Celtics, but with the recent moves by the Bulls and their ability to sign two big-name free agents to play alongside Derrick Rose and Joakim Noah, the Bulls would be instant title contenders with the signing of LeBron James and either Chris Bosh or Amare Stoudemire.